A sequel to Calvin and Hobbes? Everyone I know loved Calvin and Hobbes, the comic strip about a boy and his stuffed tiger. Some comic artists have now imagined a kind of sequel, where it’s 36 years later, and Calvin is all grown up and married to Susie. And he has a little girl who’s playing with the same stuffed tiger! Each artist is a fan of the original comic strip, and it’s inspired them to create some wonderful artwork. There’s a real fondness for the original characters, and it looks like they’re trying to stay true to the spirit of Bill Watterson’s original strip. The original Calvin and Hobbes ran for 10 years, from 1985 until 1995 (according to Wikipedia), and there’s apparently a lot of people who still really miss it. The first artist drew just four full-color “Sunday” comic strips back in 2011, according to an unofficial history of the project. Keeping with the tradition of playfully naming zany characters after famous philosophers, he’d imagined that Calvin would name his daughter Francis Bacon, and the strip was called “Calvin and Bacon”. But then other online comic artists — who were also fans of the strip — decided to continue the idea. 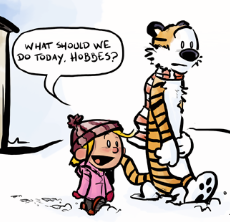 There’s now three different cartoonists who have each created a few more strips, imagining the further adventures of Calvin, and the little girl who inherits his beloved stuffed tiger. I thought they were inspired partly by this heart-tugging painting of a grown-up Calvin, who first re-discovers his tiger Hobbes in a box in the attic. But it looks like that painting was done in 2013. I guess it means lots of people have found memories of Calvin and Hobbes, and maybe also a secret wish that the characters would somehow magically come back! I thought Fight Club was the sequel to C&H. How I always heard the sequel of Calvin and Hobbes was he gave it to his daughter and after a while it was left in his attic. When he is dying in a hospital bed, he calls for his grandson, and tells him all about Hobbes. Calvin’s grandson leaves hugging Hobbes in one hand, and waving to his grandpa in the other.